I got a phone call from my husband that was fairly unexpected – he said we were going to need to evacuate our home because of Hurricane Irma. Given the devastation that just faced Texas after Hurricane Harvey, I immediately began thinking about all of the “what ifs” (you know, those terrible things you shouldn’t think of because they don’t really help the situation – they just make you freak out and stress). …what if our home floods? …what if a tree breaks and smashes our roof? …what if something happens to one of my neighbors? We just moved into our home – we are brand new to South Carolina and I am not super familiar with hurricanes to begin with (ask me about an earthquake or a typhoon and I have got you covered), so it’s probably a fear of the unknown. I am afraid of all the what if’s, and I am also more afraid of being unprepared. So I am doing what any plan-loving, type-A individual would do. I am making a list (checking it twice), packing and prepping our home and our belongings and our mentality for what could potentially happen. Please note: We are going to be safe, and secure. We have a place to stay (and thank you to those who have graciously opened their homes to us – that did not go unnoticed). The thought of course that we might not come back to a home, depending on the severity of the hurricane, is a scary one. It also has me really thinking about the idea of “essentialism”, “minimalism” and “having what you need”. Stuff is stuff, right? But stuff also has emotional baggage and ties connected to it – that’s one of the reasons we hold onto it. Of course, one of the main things I am thinking of is our book collection. I wouldn’t dream of leaving our home – with any potential that it might not be here (or it may be in a damaged state) when we return – without some of our most important books. Writing is one of the easiest ways for me to not only calm down, but to think and plan. 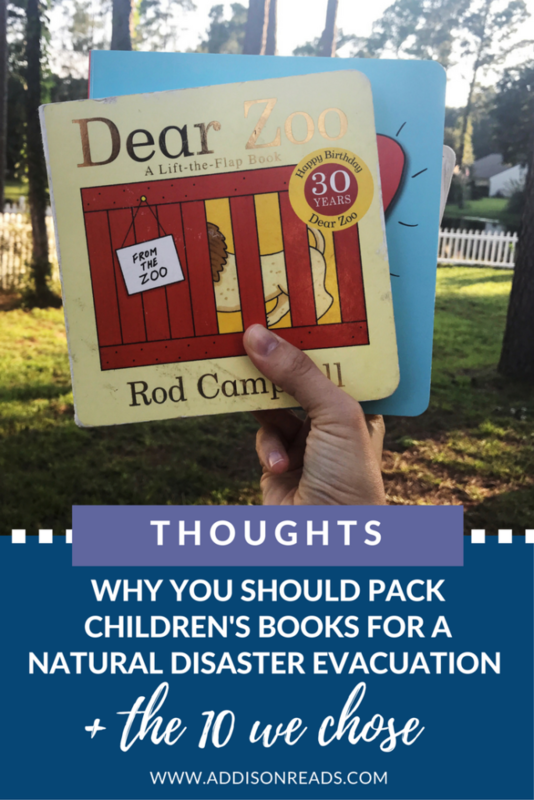 So, this post is about how and why to pack children’s books for a natural disaster like a hurricane (and which 10 books we are taking with us when we leave). In the case of a Hurricane, there is the unknown of the state of your home when you return – and if you value the books your read to your children (you should), ensuring the most loved ones are safe is important. If (knock on wood) something were to happen to your home and all of your belongings, your family would still have these books to bring comfort. Books are a seriously convenient and travel-friendly form of entertainment. They are relatively light, stack together nicely and are not bulky. They are excellent for long car rides and typically hold your child’s attention longer than an action figure toy – speaking from personal experience. This relates to #1 but there is a certain level of comfort and consistency when it comes to reading the same books. 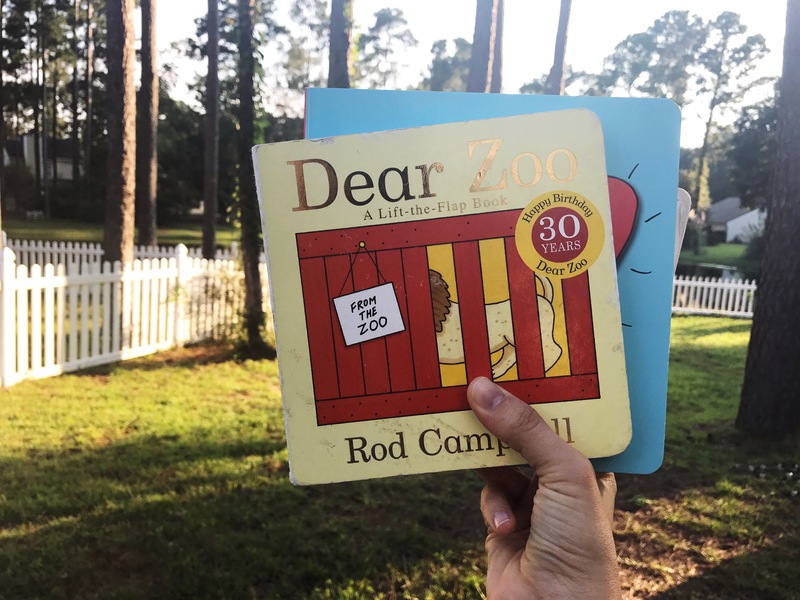 When my husband was away for 8 months, we continued the tradition of reading books we read with daddy every night (books like Dear Zoo, etc). These kept us feeling connected to him, and despite all of our travels, there was a singular constant that kept us connected and feeling like not everything in the world was changing. 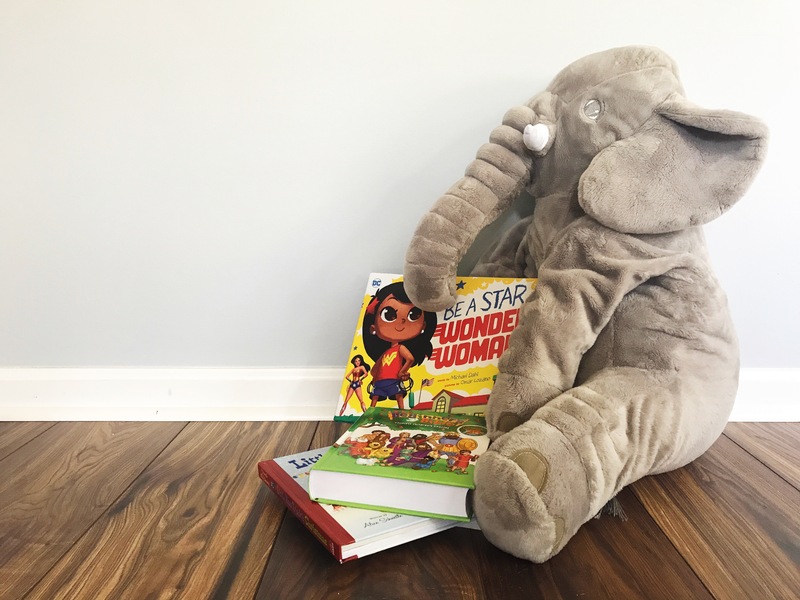 Bringing these books along with you might help ease the transition and make the whole thing less scary and chaotic for your child. I’ve broken this part into 2 sections: how to store and how to pack children’s books for a natural disaster. Namely, what do you do with the books you leave behind? 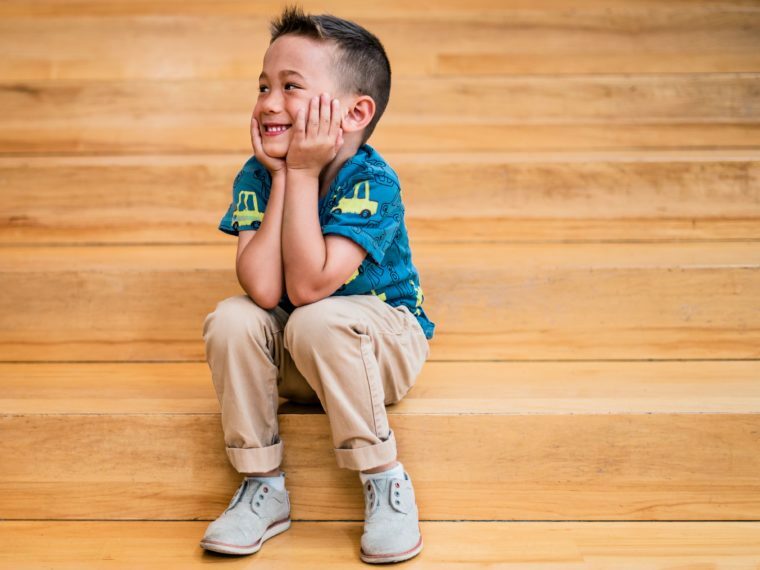 How do you pack the children’s books you’re taking with you in a simple, non-overwhelming way? How do you decide which books come and which ones stay? One thing I really stress to my intentional parents is that every book on your intentional bookshelf should be one that you would not want to part with. Every book should have a meaning or a purpose (and if they all don’t you absolutely need to sign up for the #ReclaimYourBookshelf challenge). So how on earth do you pick and choose between several A+ books? Any one of these reasons. Most books can be replaced, that’s just the fact of the matter – so take the ones with you that have deep sentimental meaning and value and you would be sad to find destroyed. We are fortunate enough to have a two-story home which means all of our home goods will be going upstairs in case of flooding, including our books. But once in there, we will be putting them in boxes, covering the boxes in towels (in case water leaks from the ceiling or windows) and storing them in a closet. Books are so important to our family, the last thing I want is to come home after this hurricane and find all of them have been destroyed, we would be heartbroken. Interestingly enough, this used to be a bit of a hypothetical question I would ask, but now it seems rather relevant. If your bookshelf was on fire, what 3 books would you save? By the way – your thoughts & prayers are so so appreciated! Are you having trouble deciding what you’d take with you? Now honestly, as hard as it was to imagine having to leave behind some of our books (just because I wouldn’t want to – but it’s the reality of the situation) it was not hard at all to decide what to take and what to leave behind. And that’s for a very particular reason. Our bookshelf is pretty darn intentional. It is not without flaws (which is why I, too, need to clear out the bad) but I am very clear on what we have on our bookshelf and each book’s individual purpose. Why is that? That’s because I have an Intentional Bookshelf. 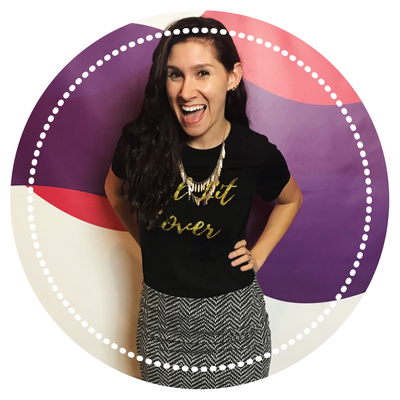 I want to help you create one, too! 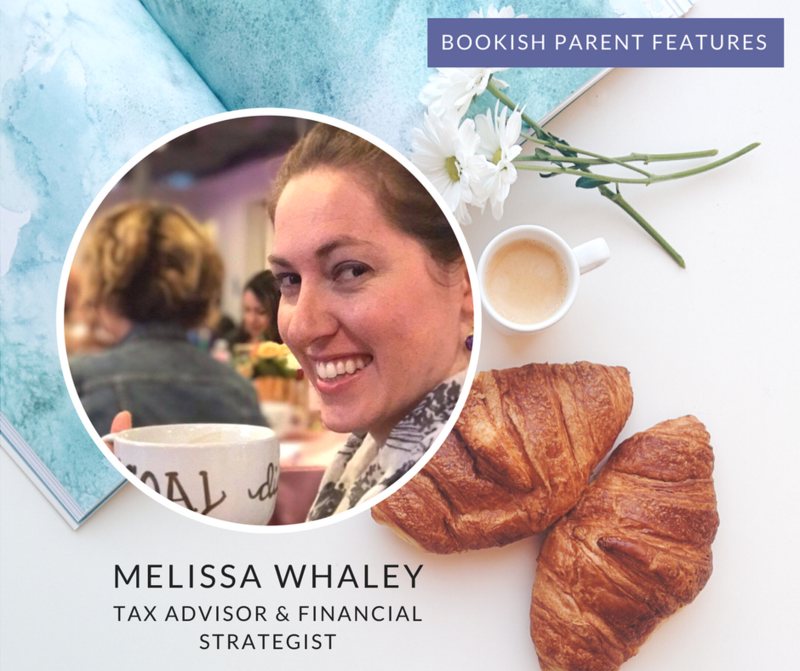 The best way to get started is to join the #ReclaimYourBookshelf challenge, so you can clear out the books that don’t serve your family the books that are diluting your parenting message. Another way to say this is – get rid of those you definitely wouldn’t pack in the case of a natural disaster because they just don’t have a good purpose. I have created a whole video to walk you through why this challenge is so imperative and why you need to join right away. Also, it’s super easy to join in (you can fill out the form at the end of this post) – and this video is a nice mix of funny while still being informative! Enjoy. Sign up below to join the #ReclaimYourBookshelf challenge!